Wiley X Victory kids sports glasses offer everything you'd expect to keep your kiddos safe on the court or out on the field. These kids sports glasses also double as kids sports goggles with the option of an adjustable elastic strap that attaches to the end of the temples. These Wiley X sports glasses are built with scratch resistant and shatter resistant lenses that meet sports safety rated standards so you can ensure they were built to last. 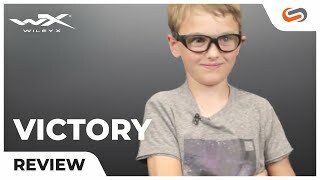 If your child has Rx-need and a love for sports, the Wiley X Victory prescription sports glasses are an awesome option.